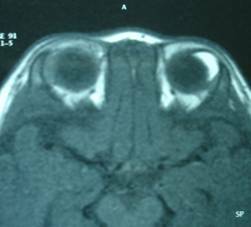 Congenital malformations are rare. They occur during the embryonic period and are usually diagnosed at birth. They range from very mild to severe and disfiguring. Some still have minor relevance by association with other systemic diseases. Therefore a thorough study of any malformation is mandatory. Colobomas: absence of a lid part, as a crack or defect. 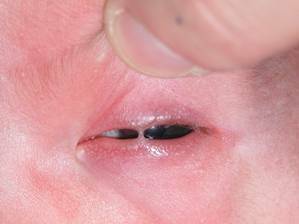 Epicanthus: a fold at the medial canthus which is usually bilateral. 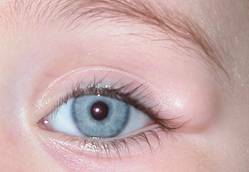 It may cause a false strabismus by its asymmetry. Generally it does not require treatment. Ankyloblepharon: welding the upper eyelid over the lower. 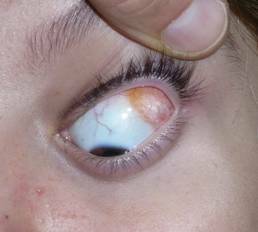 Euriblefaron: in this condition the lid does not make normal contact with the eyeball. Epiblefaron: redundant skin and muscle in the lower eyelid which reverses the position of the tabs, is confused with entropion. It causes conjunctival irritation symptoms. 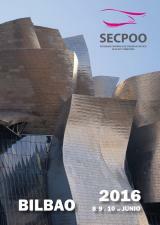 If it does not recede in the first months, it should be treated surgically. 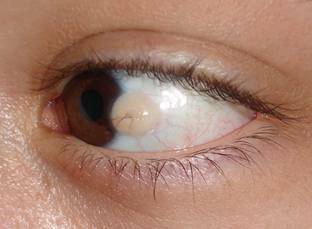 Dermoid: is a benign tumor of the conjunctiva presenting as a solid mass in the conjunctiva or near the cornea. It may be associated with other diseases. They are generally small but large ones can affect vision in which case they require surgical treatment. 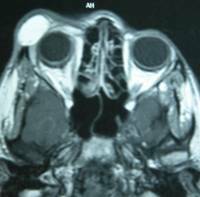 Lipodermoid: tumour which tends to remain unnoticed, and is usually evident only when the eyelid is everted, appearing in the upper outer angle generally. They are pale yellow fluctuating soft dough. They usually have hairs inside. They must be differentiated from fat hernias. Subcutaneous capillary hemangiomas: it is the most common benign tumor in childhood. 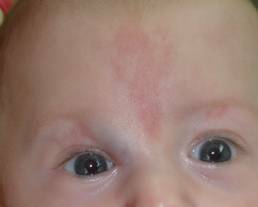 They appear as red patches or red-wine spots on the eyelids, forehead or face. They can affect vision and therefore require close monitoring by an ophthalmologist. May send something with age. They can occur at in the orbit and this changes the prognosis. 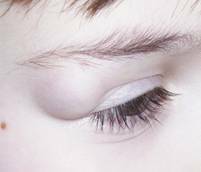 Eyebrow tail cyst: epidermoid cysts appear more frequently in the tail of the eyebrow. They arise from embryonic residues included in the bone fusion zones. They are usually easily recognized. They are usually painless and do not cause more than cosmetic impairment. Imaging tests such as CT scan or MRI may be performed for a more detailed evaluation. 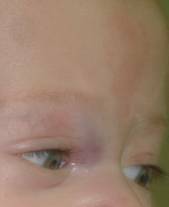 There are other craniofacial malformations that affect the bones, causing more serious consequences. In these cases they require the intervention of several specialists for improvement and it is not uncommon for some of these patients to undergo several operations throughout their lives. Very significant alterations in the eyelids can maintain vision for years. Some birth defects require no treatment, especially if they are not associated with visual impairment. Lipodermoids and dermoids are only treated surgically if they are very large or for cosmetic reasons. Some may recur over time. 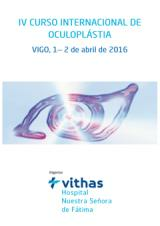 Epiblefaron: its treatment involves surgical excision of skin and orbicular muscle. 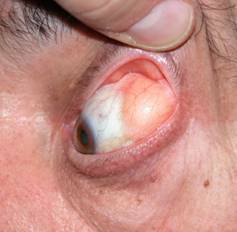 Recovery is excellent and usually does not cause sequelae in the eyelid. Ankyloblepharon must be treated immediately as all those defects that prevent or modify in any way the passage of light to the eye. In this case with scissors or simply separating the lids removed adhesion. 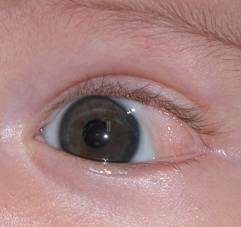 The defect must be sutured when treating coloboma. Eyebrow tail cysts can decrease with age. Treatment is surgical with excellent recovery for the child. There is no set criteria regarding age of intervention. Depending on the size it can be made between the ages of one and five. Capillary hemangiomas can now be treated with beta-blocking drugs under strict medical supervision. Alternatives include intralesional steroids or laser.